2017 has been a mixed bag across southern and eastern Australia - good starts, poor winters, better springs, dry all the way, frost, and just about every other challenge that can be thrown at growers. There are some take-aways from this season -as there is for every year. The only certainty is that 2018 will be different to 2017, and so planning a crop nutrition strategy is a key part of preparing for 2018. In essence, we are in the "pre-season" for the 2018 crop and while what is done now may not guarantee success, it will help guide our program. On the other hand, a poor preseason is not a good way to lead into the season - and poor preseasons promote poor performance. At this time of year - around harvest time - growers are seeing more of their paddocks so using yield maps and observations we can start to build up a picture of what we know and what we know we do not know. Known knows are poor and better areas of paddocks, the yields, and maybe the nutrient (N in particular) concentration in the grain -which combined indicate crop removal. Grain nutrient concentration does very with yield and soil type, so it may be useful to have some grain tested. Crops cut for hay will also export nutrients, and generally much more potassium than if the crop was harvested for grain alone. The way stubble is managed is also important, with significant nutrient losses where stubbles are burned. With a good soil test an estimate of the nutrient supply can be made and the removal and soil tests are key parts of the phosphorus decision going forward. What is unknown is the demand of the crop for 2018 - although using crop simulation models can assist with this. We also do not know if losses through leaching and denitrification will be small, medium or large. Legume performance from 2017 can also inform us about N status going forward. Nitrogen fixation in well nodulated crops can be significant although removal of N in the grain can also be large. Crops like lentil and chickpea are almost N neutral unless there has been something that restricted yield but not growth - such as a late frost or disease. What happens between now and seeding depends on mineralization and immobilization and losses - which in turn are a consequence of conditions over summer and autumn. Good weed control becomes important to ensure N and water are not lost on summer weeds. N-rich strips are a good tool to set up for the 2018 season to guide N management in-crop. Take a short term view tactical view with N.
Fixed N on failed legumes – maybe a bonus. Use an N-Rich strip to guide N decisions in-crop. 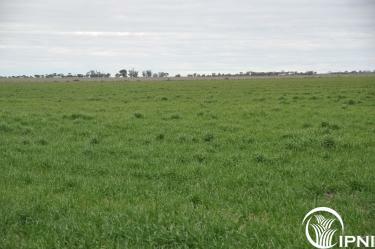 P at sowing is the only real option – banded placement near seed row. Take a long term strategic view with P, can adjust rates to off-take plus a tip if soil test at or above critical. Have some P at sowing.